Writing about leadership is bizarre. If you write about something, you should know what you are writing about. If you profess to know a lot about leadership – or at least enough to write about it – does that mean that you are holding yourself out as a role model? In trying to determine the most accurate, though totally subjective, answer to my own question, I decided to think about the leaders I know or have known in my life. First, there was my mom. She led through a balance of compassion and control. My father led through years of hard work followed by years of stories of what he learned by working so hard. My first pastor, Brother Fred, was a Native American leading a small Christian church in rural Mississippi. He led by demonstrating that words of kindness may soothe but never eradicate the pain caused by words of hate. My high school English teacher led by gentle challenges to all of his students that you are never as accomplished today as you could be tomorrow. An early social work supervisor led by showing patience, persistence and passion – all while working with the kids rather than hanging out in the office. Each of these souls imprinted their form of leadership on the way I feel and think about the world. So, I wonder. Is this leadership? Is it impacting another in such a way that the other person is forever changed by the encounter? If so, can there be negative leaders? Surely, there are. If not, many of the warnings I received as a child were simply scare tactics meant to keep me on the straight and narrow (I think they worked to well.) I believe there are leaders who lead without ever realizing people are paying attention. I know there are leaders who use their skills and personal characteristics to gain more for themselves than they ever help others achieve. I think there are leaders who believe that they should be followed and who criticize those individuals who refuse to follow them. Luckily, I don’t work with these people. I don’t see any of these leaders in partnering organizations or in our membership. I haven’t spotted these leaders at our workshops or conferences. In our world, I see the other leaders. The ones who understand that a simple gesture of good will, an act of patience, a sharing of resources, a hug of support or a nod of validation can be critical. These leaders don’t look for THE moment to make a difference because they realize that EVERY moment is an opportunity to create change. John Quincy Adams said, “if your actions inspire others to dream more, learn more, do more and become more, you are a leader”. Our social service field is filled with leaders at all levels. Youth, professional youth care workers, managers, clinicians, executives, administrative staff, drivers, volunteers, cooks and receptionists - each spread ripples of positive impact in the streams in which they swim. I guess maybe the most often missed characteristics of leadership are humility and gratitude. I am learning to be a leader. Thanks to all of you who are learning with me. 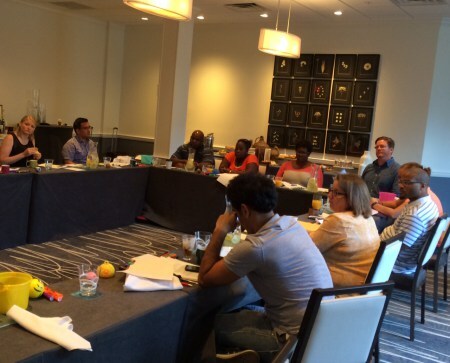 Speaking of leadership - NSPN members and licensed Safe Place agency staff gathered in Savannah, Georgia last week (August 12-14, 2015) for the New Leadership Institute. Participants identified their leadership strengths and challenges, assessed leadership styles, developed skills, and learned new methods of decision-making. Stay tuned for details about upcoming NSPN leadership-focused events! Comments on "A Personal Reflection on Leadership"